This book is result of my thirty-year love affair with astrology. It all began in the Sixties when I was studying psychology at Eastern Michigan University. From a very young age, I was interested in philosophical questions about the purpose of life. I had always asked difficult questions of the ministers, rabbis and priests of various religious. I was hungry for answers to questions for which they had no answers. They were all nice enough, but it seemed to me that they were "just doing their job" or were limited to giving very specific dogmatic answers. The fire of inquiry and passion for truth was not in them. Studying psychology and philosophy at the University gave me a similar feeling. In general, it seemed that the academic world had selected a safe and generally agreed-upon curriculum for our education, one heavily slanted toward modern scientific and technological goals, avoiding religion, esoteric truths and controversy. One of my favorite questions had to do with cause and effect: Do we live only one life or have we had many? The center of that questions asks: "Who am I? Why was I born in my particular circumstances? What is the ultimate purpose of life? What is the Soul? Who is God? What is God's intention for life? Does the individual continue after death? What is justice? Who created right and wrong? What is the purpose of the laws of Nature? How does Nature operate?" I would often ask how God could be called loving and yet give everyone only one obviously unfair chance at life and then extinguish or punish them for failing to achieve some unwritten and abstract goal. I never stopped asking difficult questions. One ray of hope amid the lab rats IBM punch cards at the University was the writings of the psychologist Carl Jung. Here was an adventure not afraid to look at divergent world cultures and entertain their exotic thoughts. As I read his works, I discovered him keenly interested in Eastern thought and -of all things -astrology. In fact, near the end of his career he observed that you could know more about a person by calculating his horoscope published as entertainment in the daily papers. I was equally certain that most people with stethoscopes couldn't mean the horoscopes published as entertainment in the daily papers. I was equally certain that most people with stethoscopes couldn't tell you anything profound about your self. Why then was this otherwise very intelligent and famous psychologist practicing -no, even worse- promoting astrology? That question became one that I have heard quite often over the last thirty years. Repeatedly, people would ask me: " Why is an intelligent fellow like you an astrologer?" Whereas I asked myself why my otherwise intelligent professors failed to follow Dr. Jung's Lead and Study astrology. Unfortunately, neither the Western psychologists, religionists, scientists of Philosophers had any new insights about astrology, karma reincarnation or the rest of my questions. I once proposed an astrological study to my psychology professors. They answered that the government would not be giving any grants for astrology research - now or in the foreseeable future- unless, that is, I could prove some obvious military use. Thus it was that astrology became my private passion. In my academic work, I completed majors in English Literature, Psychology, History and Comparative Religion. What I observed through my studies was that almost every great thinker who preceded us had some association with astrology. 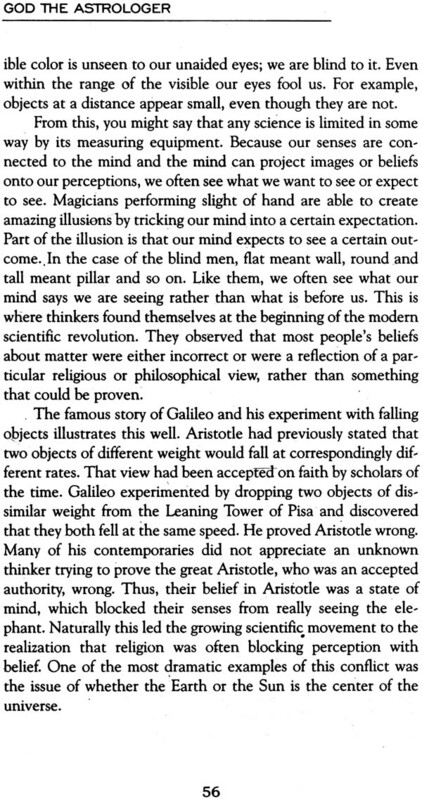 I wondered if perhaps the ancients were mostly fools and we modern thinkers had finally achieved enlightenment, which was the prevailing view among my professors. The other possibility was that, in our rush toward modernity, we had lost sight of some great wisdom that the ancients knew. Because I did not perceive myself to be surrounded by enlightened beings with answers to life's great questions, I went for studying ancient cultures. Besides, if all the thinkers of the past were so ignorant, why do we call studying them "getting an education"? Now I threw myself into the great ocean of world thought. I began my study of astrology along with any shred of religious, spiritual, and metaphysical thought available from every ancient culture. I exercised my fledgling knowledge for a deeper understanding of the relationship between humans and the cosmos. At last, I began to study ancient thinkers and all the fragments of their thought that have survived. I also began to observe the planets and stars, something I have continued now for thirty years. That is the basis of science, to observe and try to find correlations between one phenomenon and another. That is also the fundamental premise of astrology, that the movements in the heavens above us are invisibly connected to events on Earth. Like any scientific experiment, there must be a constant and a variable. In astrology the constant is time, measured by the steady movements of the planets and stars. The apparently inexplicable variant is human behavior. How do cause and effect unfold over time, and what are the linkages between the remote cause and the local effects.? I also discovered that the more you study history, the more you see evidence of how much human achievement and learning has been lost. Most of us have been taught names and dates on battles as the primary focus of history. As Donald Nichole, one of my favorite professors, used to say, "In the study of history, these are always two things: what was happening and what was going on." As I stepped outside the limitation of the university circle of thinking, I found myself in the larger universe of culture and knowledge. It became increasingly clear to me that the story of history I had been taught in school was an edited version written for a particular social purpose. Did you know that the word curriculum means racetrack? At an even deeper level, I began to see that it was also a "race" track. The victor in warfare writes the history, often to vilify and diminish another race or culture and justify its own actions. The more I looked for truth, the more it eluded me. It was hard to imagine that so many incorrect understandings were woven into accounts presented as the truth by supposedly professional and objective teachers. Eventually I became what I am today, a kind of historical private investigator unraveling the mystery of our past. I knew intuitively that, somehow, astrology was an important piece of that puzzle. I had no idea at the time how true that intuition would prove to be. Over the years, I came to think of myself as a kind of spiritual archeologist. Why spiritual? Because we have lost our connection to a time in the past when spiritual knowledge was as abundant as information is today. It appeared to me that many scientific enterprises focus on academic facts and external material data. I saw an abundance of data and a deficiency of meaning. If ours is an information age, thousands of years ago there was a spiritual age. In between there were Dark Ages which erased many of the links to our past, including those links to ancient astronomy and astrology. There was a time within the last ten thousand years, and probably earlier, during which very sophisticated cultures existed. It is true they did not develop science culminating in industry and our current version of technology. Yet it is equally true hat they developed astronomy medicine, language, architecture and religion to levels tha are still far beyond our understanding. Ancient does not mean primitive. I returned to older cultures to retrieve gems of wisdom from the scattered literary ruins that remain. It has led me on a merry chase. Initially, I was led back to the Greek culture of 2,500 to 2,800 years ago. In school we are taught that this is the starting point, that our Western civilization began with the Greek thinkers Socrates, Plato, Aristotle, and so on. However, the Greeks were late in history compared to the African, Chinese, Egyptian, Babylonian, Indian, and other ancient peoples. In fact, they copied much and invented little. So I found myself going even further back, before the Greeks. As I studied the history of language, archeology, astrology, medicine and religion, my path kept ending up in India. That ancient land of spices and mystery repeatedly emerged as the place of origin for all human culture. In fact, it is now provable that there is a very direct line of historical and linguistic development from India to European culture. Perhaps you are wondering how all this relates to astrology, which is where we began and are going. Let me explain by continuing my personal story. I'm sure you have heard the saying "knock and the door will be opened." The corollary is "when the student is ready, the teacher appears." In my case that meant I was a prime candidate for initiation into the Vedic spiritual teachings of India. The Vedas are a kind of Ph. D. program for anyone interested in the full potential of religious and spiritual understanding. Until recently, it was very rare for Westerners to gain entrance into the secrets of the Vedic religion. For the first time in thousands of years, many of my generation did exactly that. This acceptance took us beyond an academic or intellectual approach to the sacred Vedas and into heir very core. As it turned out, this was a necessary first step in order to understand the true place of astrology in the greater universe of thought. The astrology I first learned was a fragmented hand me-down from the Greeks. 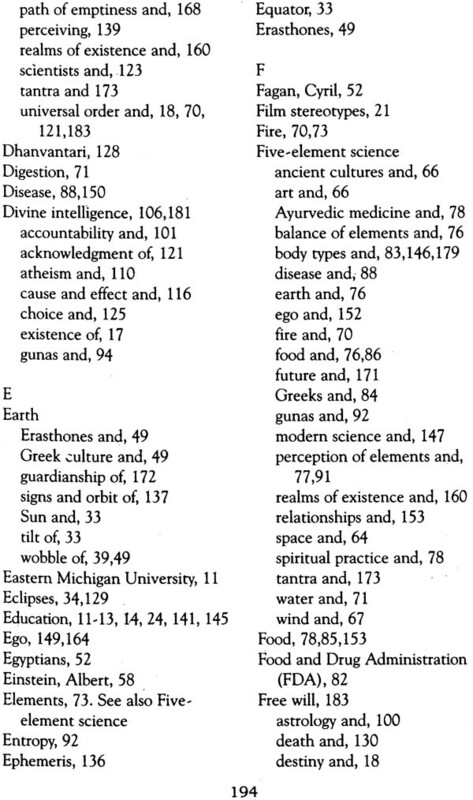 I studied the modern Tropical, or so-called Western, astrology and practiced it for some years. 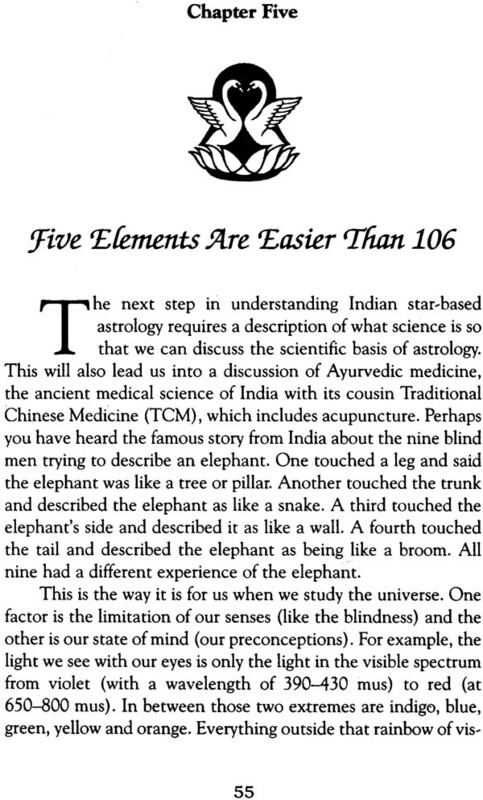 Then I began reading books on Vedic astrology from India. 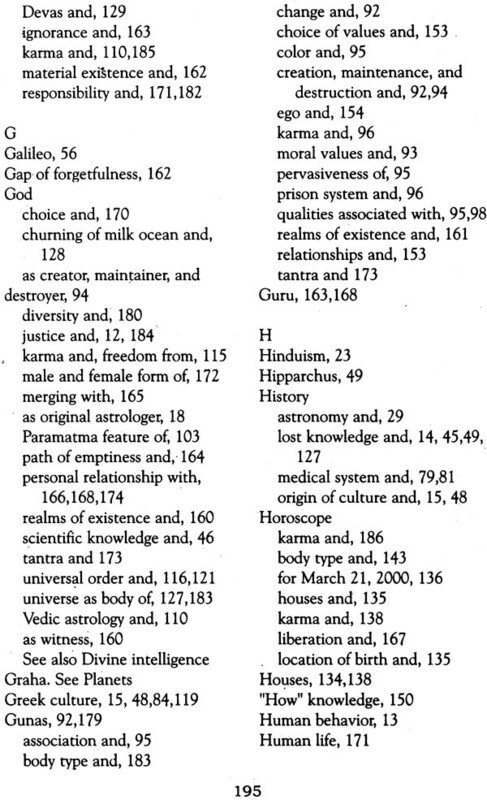 Eventually I found a master of Vedic astrology from as it has been practiced for thousands of years. Imagine my surprise when, among other things, I learned the astrology that the West had inherited from the Greeks is no longer properly connected to the stars. In fact, the actual historical zodiac of twelve star-groups is now twenty-three degrees off from the dates currently used by western astrology In simple terms, this means you are not the astrological sign you have been told you are. In most cases, you are actually the previous sign. If you think your Sun sign is Aries, you are really Pisces. If you think your Sun sign is Leo, you are really Cancer. The same is true for all the planets. It also turns out that we are not in the Age of Aquarius, nor will we be for at least four hundred years. Astrology, and in particular the Vedic astrology of India, is the missing link to our understanding of certain key spiritual questions. It also holds the keys to understanding our individual body type, which is one of the lost secrets of medicine. Vedic astrology is also based upon an understanding of certain natural processes that are the basis of right and wrong conduct and the science of ethics. It holds the keys to an understanding of the angelic realism of divine beings who animate material Nature. It explains action, karma, reincarnation, and how Divine justice is ultimately achieved. I further discovered that the big three religions that arose in the Middle East-Judaism, Christianity and Islam-are missing both a cosmology and a paradigm of sacred material science. If you read the Bible, Torah and Quran, you will not find detailed information regarding how the universe was formed. You will also not find a scientific description of the elements that compose material nature or how they combine to form the world. This void has been filled in modern times by a materialistic scientific view of the cosmos that is either skeptical of God or outright anti-theistic. Many cosmological and evolutionary theories put forward by scientists are merely speculations based on scanty evidence and capable of many interpretations. However, the atheistic worldviews have been widely accepted and appear on television and in movies as if they were "scientific truth." In fact, they are new "non-religious religions" which conform to an empty and atheistic worldview that is a reaction against the overly dogmatic and zealous followers of the above three religions. I discovered in the Vedas of India an ancient literature that predates the other major religious texts. 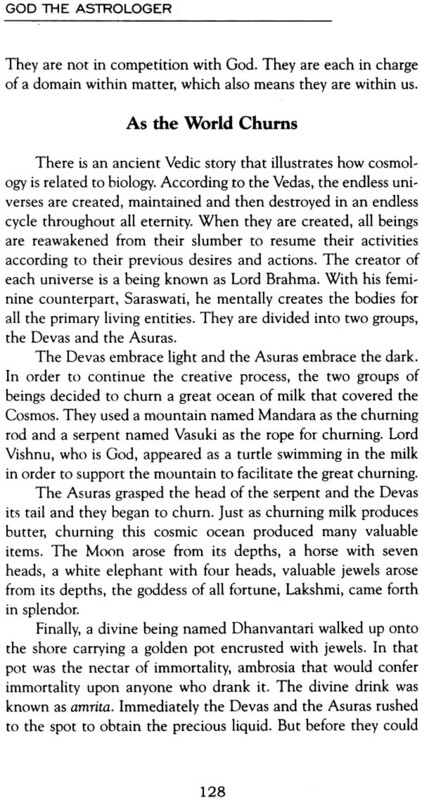 The Vedas present both a theistic religious worldview and a detailed cosmology- an extremely scientific model of how matter is created, maintained and destroyed. The greatness of modern science and technology is that it has gathered an unprecedented amount of information about how matter works. Its weakness has been in denying the obvious. The obvious truth of our universe and existence is that we and the universe were designed by and are supported by a purposeful and divine intelligence. The universe is a work of art and great invention, and God is the great artist and inventor responsible for its being. That is not dogma; it is intelligent observation. All true religions share the experience of God's intelligence pervading the creation as the laws that make it work. However, not all religions have information about the details of how the Divine intelligence carries out justice in the realm of matter. 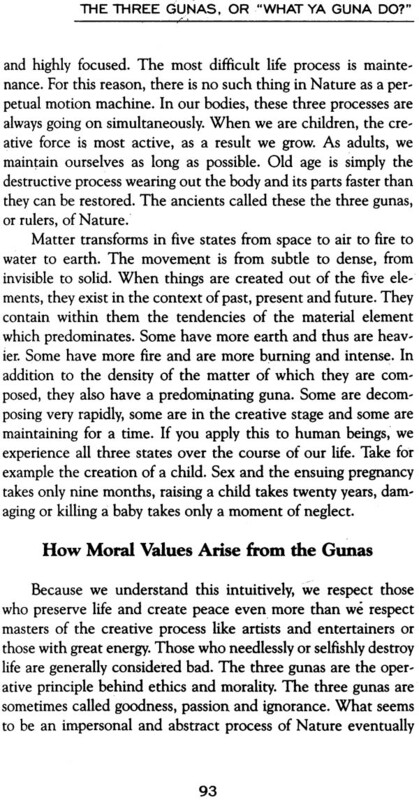 The Vedic view of cause and effect extends "every action has an equal and opposite reaction" to its ultimate conclusion. According to the Vedic view, the laws of nature are a judicial system that is presided over by intelligent beings who are agents of the Supreme Godhead. We, the actors in this world of matter, are all eternal souls who are continually given feed-back or reactions to our actions. Those reactions manifest from life to life, even though their origin is forgotten by us. What goes around comes around. According to Vedic astrology, at the moment of birth the positions of the stars and planets are a kind of score card or electronic sign in the sky. Properly understood, they contain the mysteries of our past, as well as results that are due to happen in the future. 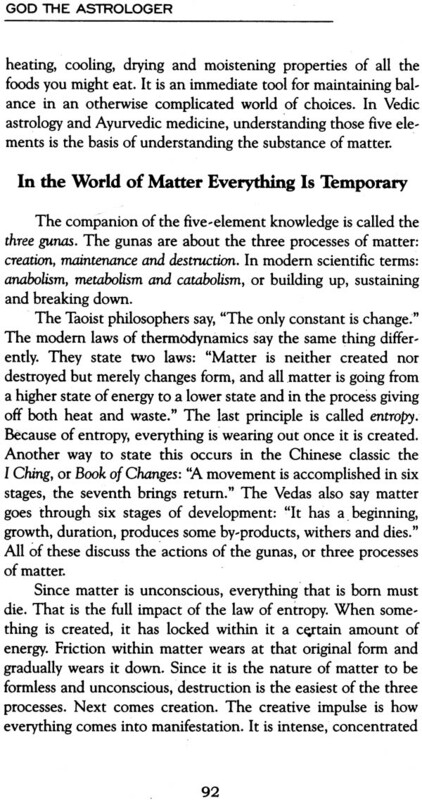 The laws of matter and its endless combinations are included in this purposeful view of cause and effect. The many things I learned all pointed in one direction: God is the original astrologer. The Supreme Person has engineered a realm of unconscious matter where we the eternal souls may come to experience our individuality. 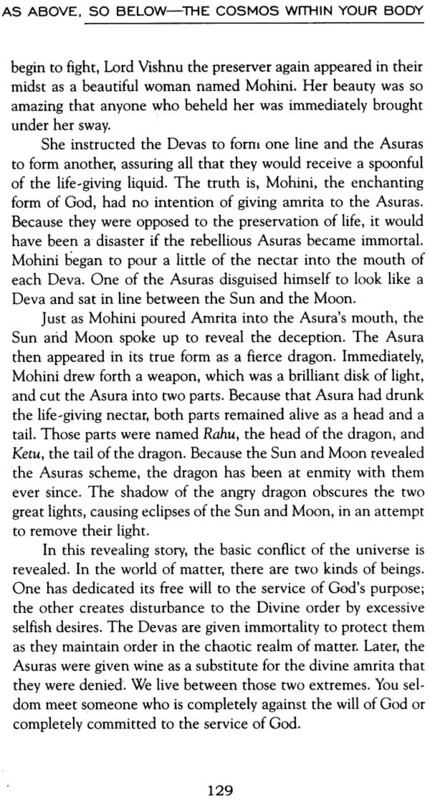 That realm is managed by angelic beings, or Devas, who administer cause and effect. Since we are eternal souls, we reincarnate in matter and continue to receive the reactions to our previous actions. The stars at the moment of birth reveal the destiny we have previously created through free will. All of this is orchestrated by God the Astrologer. In short, I discovered that astrology is not about fortune. Telling but, as Carl Jung suspected, it is deeper than psychology and is at the very basis of medicine. True astrology is the missing link between religion and science. If that sounds like a very different definition of astrology than you have previously understood, read on as I try to share my discoveries of how God's Divine Plan is revealed through an understanding of Vedic astrology. To quote William Shakespeare, "There are more things in heaven and earth than are dreamed of in thy philosophy, Horatio. For the moment, pretend you never heard of astrology, and come with me to the ancient temple of the heavens that existed before the pyramids or ancient Rome were built. Let us follow the lines of starlight as they descend to become the living fabric of our lives. Welcome to the inner sanctuary where the mystical language of the heavens is unveiled. God the Astrologer Systematically reveals the lost links between religion, Science, destiny, and free will. It is a clear guide to how the Divine actually manifests in the material world and how we can cooperate. It explains the true spiritual relevance of astrology in our lives and offers the profound revelation that God is the Original Astrologer. Jeffrey Armstrong is a new breed of Spiritual teacher, who has mastered the Eastern teachings of Raja Yoga, Tantra, Mantra Meditation, and Vedic Astrology. An initiate of these disciplines for over 30 years, he also holds degrees in Psychology, Literature, and Comparative Religion. A speaker at Fortune 500 companies and frequent guest on national TV and radio, his special talent making the great wisdom of the East accessible to the Western mind.